Celtic winger Kris Commons has been called up to the Scotland squad after ankle injuries forced Jordan Rhodes and Robert Snodgrass to withdraw. Commons has not played for Scotland for more than a year but could face Wales in Cardiff on Friday, with Belgium hosting the Scots next Tuesday. 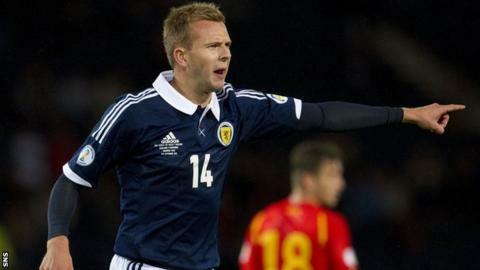 Rhodes' Blackburn team-mate, Grant Hanley, pulled out of Craig Levein's squad with a groin strain on Monday. Capped nine times, 29-year-old Commons has scored two international goals - both during Levein's time as national coach. Commons' Celtic team-mates, Scott Brown and Charlie Mulgrew, are expected to recover from injuries. Brown missed the Glasgow club's 1-0 win over Hearts with an ongoing hip problem, while Mulgrew, who deputised for the midfielder as captain, went off injured with a first-half head knock. However, Celtic manager Lennon told BBC Scotland that Mulgrew was only "a bit groggy", while Brown will have benefited by being given a rest against Hearts. "We're hoping, for Scotland's sake, he recovers," Lennon said of Brown. Meanwhile, Scotland captain Darren Fletcher was not involved in the Manchester United squad that faced Newcastle United on Sunday. The midfielder, who had been out of action for 10 months through illness, made his first start of the season last month against the same opponents and was in the starting line-up as United defeated Cluj in the Champions League.